While Online Poker NY is primarily dedicated to the legalization of the game in New York, there are still a few USA poker sites outside of the state that are worth mentioning. 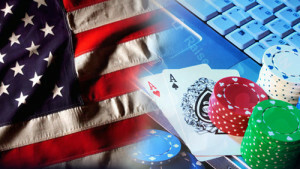 Each of the below sites have a reputation of integrity and are worth a visit for anyone looking to play online poker in the USA. Since 1991, BetOnline has been offering online gambling services. Now they offer an online poker client that is available to all US poker players. The site boasts over $150,000 a month in tournament guarantees along with a solid range of online poker traffic at lower limits. The poker client is somewhat simple and focuses more on poker than on cheesy graphics. The player base is still growing but there is still ample action in lower limit cash games. Those looking for a free bankroll will love that the site offers three freeroll tournaments daily. The client is available for both Mac and PC and the site offers welcome bonuses of up to $2,500. Full Flush Poker has only been offering real money online poker since November 2013 but it has developed quite a following among amateur poker players. The site offers a hefty 150% deposit bonus and 20% cash back credited to their accounts for deposits of $50 or more. To say that the players are soft at this site is an understatement. The player pools at this site are still somewhat small, which means many of the better players haven’t bothered to join. This is great for those looking to build a bankroll. However, this means that most of the cash games are lower stakes. Lower traffic also means that many of the tournaments are offering overlays but that works to the player advantages due to the sites deep and somewhat irregular payout structures. Another plus is that there are no late registrations at Full Flush. Carbon Poker is one of the only US facing online poker rooms with mobile availability. Carbon is available on PC, Mac and on Android devices. In operation since 2006, Carbon Poker is the top site on the Merge Network and has over 3 million downloads to date. The poker client layout is fairly standard and the site offers one of the better spread of games for a US facing site. In addition to Hold’em and Omaha, you can find Stud, Stud Hi-Lo, Razz, Triple Draw, Badugi and even Five Card Draw. This site boasts solid traffic but the competition is still relatively soft. A solid mix of cash games and tournaments at most limits. Each week, Carbon offers a $125,000 guaranteed freezeout, one of the best among US facing sites. The only real downside to Carbon Poker is their support. Their site only offers email support, which is disappointing for a site of their size. America’s Cardroom is one of the more popular USA poker sites and has some of the quickest payouts in the industry. Part of the Winning Poker Network, the site has seen tremendous growth over the last couple of years. At present, the Winning Poker Network averages over 1,000 cash game players during peak hours. Even with that level of traffic, the majority of traffic is at low and micro limit NL Hold’em and PL Omaha. America’s Cardroom does feature guarantees for many of their tournaments. Their Sunday event features a $50,000 guarantee. The only downside to these events is that many times they depend on re-buys and add-ons to meet their guarantees. Competition is a bit stiffer on this network due to the higher traffic compared to other sites. However, it is still a great site to build a bankroll and improve your overall poker skill. Bovada is clearly the leader in US online poker. At present, nearly 3,300 cash players frequent Bovada during peak hours with more taking their seats in tournaments. The Bovada client software is perhaps one of the flashiest in the industry and gives you a real virtual poker room experience. Support is available via email or toll-free telephone. Bovada has a decent spread of games with Hold’em, Omaha and Stud poker options. Limits are available all the way to $30-$60 NL and PL and up to $10 NL Seven Card Stud. Bovada also has a solid spread of tournaments and Sit n Go’s. Sit n Go’s range from $1 to $215 and tournaments from $1 to $450. Bovada freerolls are among the best in the industry. Every month they hold a $15,000 freeroll with $1,000 to first place. Based on traffic and game spread, Bovada is a must-play online poker site for anyone in the US. Sportsbook Poker has been around since 2006 when they started on the Cake Poker Network. Now a member of the Merge Poker Network, Sportsbook poker has some of the best cash game traffic among USA poker sites. Client software for Sportsbook Poker is fairly standard with simple graphics and user-friendly layout. Sportsbook Poker has a solid spread of game with all the standard games and a few exotic ones like Badugi, Five Card Draw and Triple Draw. At present, Sportsbook Poker averages nearly 1,000 cash game players with many more in their tournaments. Action on the site is somewhat soft, which is unusual considering the size of the network.